it coordinates Venice International University courses of Italian for foreigners (V.I.U. is a consortium of 17 university from all over the worls: Università di Ca' Foscari and I.U.A.V Venice, LMU Muenchen, Tel Aviv University, Waseda Tokyo, Boston College, Université de Bordeaux, Université de Lausanne, Duke Durham, Tsinghua Beijing and Tongj Shangai). 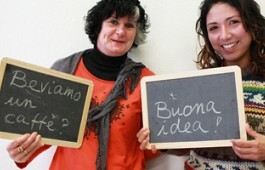 it hosts Italian classes for the international association Intercultura. it organizes Study Abroad programmes of several American universities (Colgate, Flathead valley, Towson, Purdue, Berkeley, Iowa state, Momoyama Gakuin University). the management of Generali, Fincantieri, Ikea, Lidl, Maersk, Jotun, British and American Embassy, Marriott and NH Hotels choose our courses.